Close harmony singing from the three female singers otherwise known as Ooh Baby Ooh, but here with a backing band. A basic trio can be expanded to a big band, allowing a perfect 1940s-styled recreation of the sounds of Glenn Miller and The Andrews Sisters. The craze that has swept America is coming soon to a venue near you! And to make the music that will keep those toes tapping, the wonderful female harmony group, Ooh Baby Ooh, has teamed up with The Jazz Functionnaires to create In The Mood, a fabulous evocation of the dance bands of the 1940s and 1950s. The line-up performs big band classics such as Tuxedo Junction, Lullaby of Broadway, Boogie Woogie Bugle Boy and many, many more. 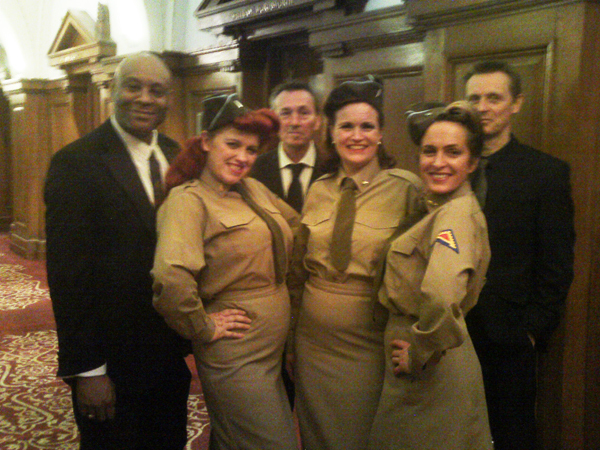 With stunning Andrews Sisters-style harmony vocals, this band will really get your event swinging. In The Mood have played at London’s famous 100 Club and at the Royal Festival Hall to great acclaim, and appeared on the daytime television show This Morning (The Richard and Judy Show).